Susanne & Rafi came to visit today. Rafi insisted that Cloudy With a Chance of Meatballs was my favourite movie and I’d surely want to watch it. Susanne insisted that he also bring Despicable Me, just in case. Now, I would have had no problem watching Cloudy for the 20th time but was rather keen on seeing something new. Rafi wasn’t convinced and kept insisting that I wanted to watch Cloudy. I won out in the end! Mirinda started the morning by not meeting them at the station. Clearly a case of communicational crossed wires which Susanne solved by texting us after waiting at the station for about 15 minutes, waiting for an imaginary lift. But this was quickly rectified and they took off for the playground at Gostrey Meadow while I prepared lunch. Apparently Susanne has come to appreciate Farnham much more since buying her holiday place in Shanklin – she was always a total city girl (for city, read London) – so they had to have a walk around before coming back. We had minted warm lamb salad followed by figs in saffron syrup. I thought the meal was quite bland but the dessert was lush! I have made it before, though, so I knew what to expect. After lunch we had a wander around the garden and Rafi asked if he could use the wheel barrow. I said of course and so he then wheeled it around the garden picking up leaves, magnolia petals and bits of twig (dirty wood, he called it). And what a fine job he did. He even wheeled the barrow back to it’s home beneath the hedge. I think I’ll show him the mower next time they’re over. It was then time to watch the movie. It’s a great laugh. I enjoyed it a LOT! I was asked whether I prefer it to Cloudy With a Chance of Meatballs. This is quite tricky because I quite like them both. 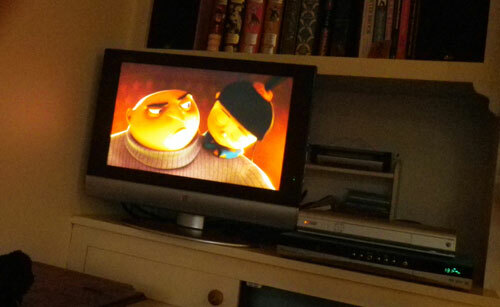 I suppose I’d go for Despicable Me simply because I’ve heard all the dialogue, something I’ve yet to do with Cloudy. Anyway, it’s very funny and very, very enjoyable. My only criticism would be the casting of Russell Brand. I really didn’t think his voice matched the character he played. Other than that…top marks. Here’s Rafi’s photograph of it. He’s getting better with the camera but I think it’s because he’s gone mad taking photographs with his DS. He showed me about 200 of them. Most of them are the same with special effects added by Rafi. I feel for Susanne as most of them are very unflattering ones of her. It was all too soon over and they had to rush to catch the train home. I did the washing up and then collapsed on the lounge. This entry was posted in Gary's Posts and tagged Despicable Me, gardening, playground, Rafi, Susanne, visitors. Bookmark the permalink.